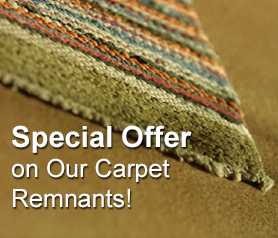 on Carpet Remnants, In Stock Specials, Beaulieu with Magic Fresh, Dreamweaver, Mohawk™ carpets and more! (386)677-9551 for more information about our products. We offer professional installation! We've had the same, professional installation crews for more than 20 years. Carpet installation starts at $3.00 per sq. yard, with FREE ESTIMATES & free non-glued down carpet removal!! If you're not planning on installing carpet in your entire house, we suggest taking a look at our carpet remnants. Carpet remnants mean the carpet is nearing the end of its roll, but there is still enough to at least cover an entire room. Often times carpet remnants are also priced lower than our full rolls of carpet. with questions about our stock specials carpet and carpet remnants.